Italy’s breathtaking Lake District has inspired painters, writers, and poets for centuries. 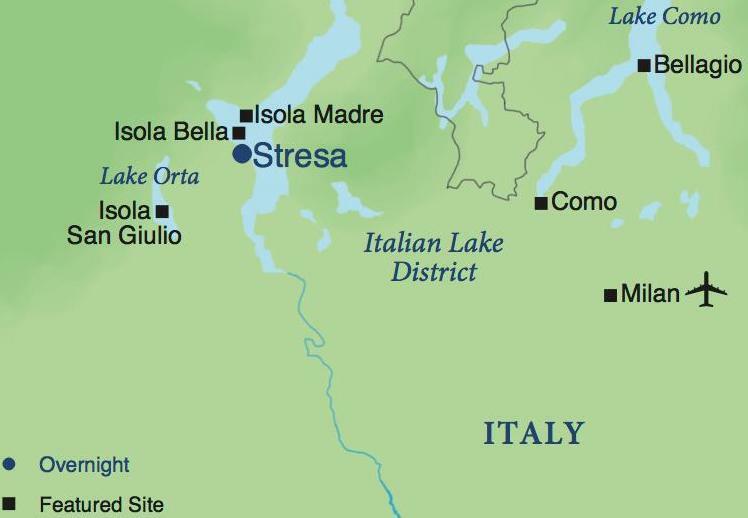 Stay in Stresa, located on Lake Maggiore, where the Alpine foothills and the brilliant blue lake fill the horizon. Explore the colorful towns around the lakes and the dynamic city of Milan, Italy’s economic and fashion capital. From romantic villas and lush gardens to an ancient basilica and legendary opera house, your journey to the spectacular Italian Lakes will be a memorable introduction to la dolce vita! Lake Maggiore: Take a private boat to Isola Madre to tour its impressive English-style gardens, then visit Isola dei Pescatori and Isola Bella with its baroque villa, outstanding art collection, and exquisite gardens. During your stay in Stresa, enjoy a regional cooking class and presentations on the area’s gardens, arts, and contemporary life, plus a day at leisure. Lake Orta: Stroll along lovely streets in Orta San Giulio, then cruise to the enchanting Isola San Giulio and its Romanesque basilica. Lake Como: Discover charming Bellagio with its villas and pastel houses and admire sweeping vistas during a private boat ride to the town of Como. Milan: See world-famous treasures, including the Church of Santa Maria delle Grazie, a World Heritage site and home to Leonardo’s The Last Supper; the museum at the legendary opera house, La Scala; and the exquisite Duomo, a Gothic masterpiece.